Well, it’s been a while since I did a proper update just on me and not on the diet. There’s a lot going on here. First, we have a new pair of foster kittens in the house – Tonks and Luna. They’re a pair of black & white sisters who are about 10 weeks old. Tonks isn’t doing too well, unfortunately. She has a congenital defect in her esophagus that makes it hard for her to swallow at this point, so we’re having to feed her KMR using a syringe so that she gets some nutrition, as well as giving her an antibiotic twice a day. It’s really wonderful having kittens back in my life, but I feel so bad for the little one, having such a hard time getting food to her tummy. Adam and I are doing our best with her. Then, there’s the relapse I’ve been going through. I just finished my last day of a Medrol Dose pack yesterday. Corticosteroids stay in your system for a bit, though, so I have some energy this morning, thank goodness. I really need to make some coffee though. I wonder, honestly, if I would have had this last relapse if I had been on Copaxone. It’s now been a month without it. I didn’t intend to go off Copaxone until we were trying to conceive a child, but sometimes things just happen. Dr. Analytis took his sweet time calling in a verbal prior authorization, so I couldn’t get my December meds for the December cost, and ACS (the new pharmacy working with Shared Solutions) has yet to call me about getting me the meds for January — and it’s already past the 15th. It makes me wonder how serious they are about keeping people on their medication. I can tell you, I truly do not miss giving myself an injection every night. Hey – on a multiple sclerosis note – a friend of mine sent me a link to an article that was pretty cool just the other day: MS damage washed away by stream of young blood. Apparently, giving younger blood to mice stimulated myelin repair, suggesting that similar type blood transfusions may help humans. So, another non-pharmaceutical “win” in the MS column. 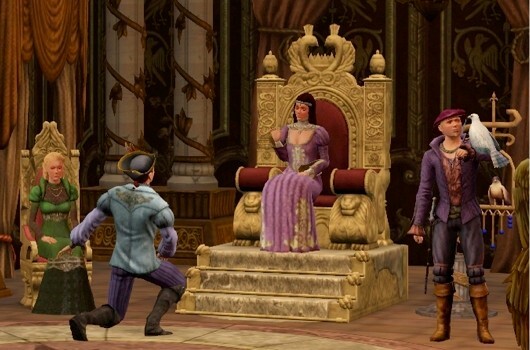 Adam and I are still enjoying the Sims Medieval – Pirates and Nobles. It’s a cute game. Very choose-your-own adventure. It takes most of the good parts of Sims 3 and puts it with the structure that Sims 3 was really lacking for folks who enjoy Adventure games. This is from someone else's game, but it's still totally cool! Other than that, not much is going on. I’m still making earrings, but I haven’t been posting them on Etsy because I still haven’t taken the time to properly market my shop. I’m still really enjoying finding and creating Paleo recipes… and that’s about life in a nutshell right now. Over 160 “comments” today to my article about new MS Meds… which were all about videos and casinos and other random BS. Thankfully, WordPress has ways to fix that crap but fast. I guess it’s my fault for letting people put their website on their comments who aren’t registered. I just don’t want people to have to register to leave a comment. *shrug* I figured it’d be easier to get interaction with my readers that way. Anyway, I’m chilling at my friend Jenny’s house today. She’s come over to my place SO many times since I haven’t been able to drive that Adam took pity on us both and dropped me over here for a day with one of my favorite people in L.A. Why do I love this girl? Because we passed several homeless people on the way to lunch, and I asked her on the way back if we could stop at Subway, and I didn’t even have to justify to her why I was buying a footlong sandwich for a homeless person I never even talked to. I saw his halloween candy stash and just put the footlong sandwich on top. I hope when he wakes up that it makes his day. Sushi, girl talk, a marathon viewing of How I Met Your Mother , Season One, and even a nice long walk (30 minutes each way!) that I completed without pain or seizure. Can you ask for better than that? I know I’ve said it before, but being off Keppra has been so astoundingly fantastic. I had a couple of seizures yesterday, but once again – restful sleep without nightmares, almost no brain fog, and I’m way more energetic. So anyway, I should get back to the HIMYM marathon of goodness and continue making bracelets. I know I keep taunting you by saying, “Pictures coming soon!” but I really mean it! I’ve got several designs now.